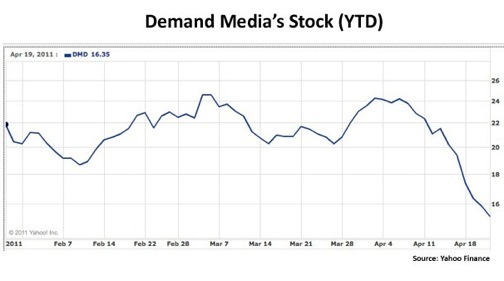 Demand Media on Monday announced that it’s Board of Directors has approved a $25 million share repurchase program which went into effect on August 19, 2011. Demand Media is allowed to buy back $25 million in shares on the open market or through negotiated transactions. According to the agreement the amount of any purchase will be based on share price, along with market conditions and any other factors that might affect the value of the company’s stock prices. Under the buyback agreement Demand Media is not required to buy back the full $25 million in stock and they can cancel the program at anytime without prior notice. It looks like Google Panda has taken a hefty $25 million bite out of the webs largest content provider.